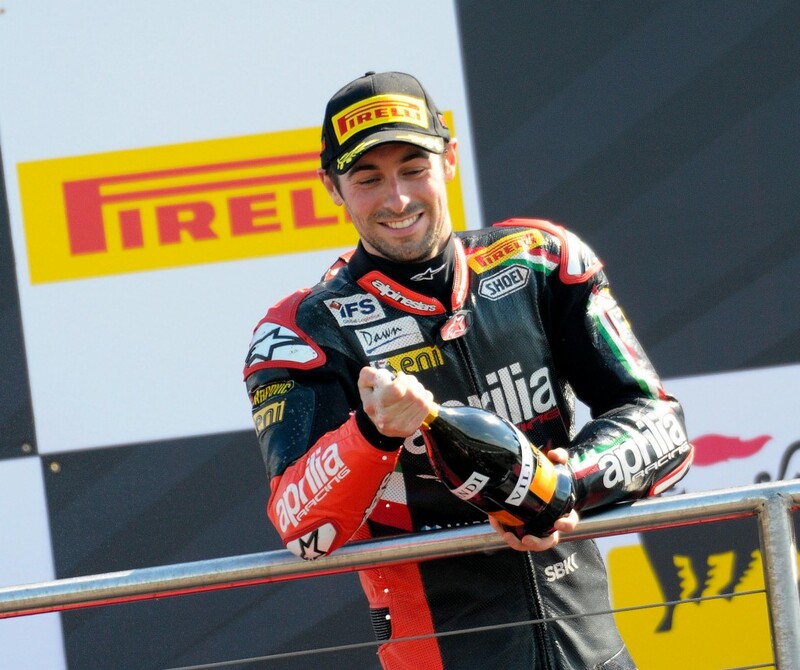 Aprilia Racing Teams Northern Irishman Eugene Laverty had a mixed pair of results at the fifth round of the World Superbike Championship at a sun-drenched Donington Park this afternoon. After the weather issues that plagued Friday the better weather continued in to race day and as the lights went out for race one Laverty made a strong start to get through Redgate cleanly before the run down Craner Curves. Unfortunately for the man currently lying second in the championship before the Leicestershire double-header, the set-up on his Aprilia RSV4 wasn’t where it should be and couldn’t run the hot pace of the front three. After a titanic battle with fellow Aprilia rider Davide Giugliano in which the pair traded hard moves, ultimately the factory Aprilia rider lost out at the flag to take a disappointing seventh place. Race two was a different story however, after making telling changes to the Factory Aprilia Laverty got away with team mate Guintoli and immediately looked more comfortable on track. Neither of the black bikes could live with the blistering pace of Tom Sykes so were left to sort the remaining podium places between themselves whilst fighting off the attentions of Melandri and Giugliano with the Frenchman leading home Laverty by just over 2.5s. Laverty said “At the end of Race 1 I was disappointed. I have always had trouble on this track, but I could have done better than seventh place. On the other hand Race 2 got off to a better start straight away. A few changes we made to my RSV4 between the two races immediately increased my feeling with it. In fact, I was able to defend third place against Melandri’s attacks, and as I said at Monza, it’s always nice to end the weekend with a podium. The performance in Race 2 is encouraging for the rest of the championship. It shows that even on shorter, more winding tracks we can keep up with the top riders. I like Portimao, I was strong there last year so I’m looking forward to the next round”. Next Next post: Guintoli "I pushed hard and gave it my all"